When it comes to marketing your business online, content is king, and nowhere is that more true than over social media. Unlike a website, social media content is tasked with keeping your audience consistently engaged. It’s not easy to do, which is why it’s crucial you have the right content for the job. BlazingSocial is a social media management company that understands: we can’t be experts at everything. That’s why we’ve partnered with some of the best and brightest content creators to carefully craft infographics on a wide variety of topics, including industry specific content, for your customers’ viewing pleasure. Social media can be a powerful tool for deepening relationships with your clients. We ensure you’ll have specialized social media content, ready to make an impression for any occasion – all year long. Holiday posts included in all BlazingSocial plans. Click an image to start slideshow. Readers love to feel inspired, enlightened, and motivated. Not only do these posts do all that, they also reflect positively on your brand and they are likely to be shared. We make it easy to brighten your followers’ days. Inspirational quotes are included in all BlazingSocial plans. People are always looking for ways to be smarter with their money. Our Dollars & Sense series covers topics like saving, money management, and personal finance advice. You’re sure to boost your follower count and generate more leads when sharing these kinds of posts. Dollars & Sense posts are included in all BlazingSocial plans. Home & Lifestyle social media posts are designed to improve the lives of your followers in the areas of home and garden, health and wellness, better living, and technology. Home & Lifestyle posts are included in all BlazingSocial plans. BlazingSocial contains a library of valuable real estate and mortgage social media posts to help your clients with information that is designed to educate, inform and entertain. These posts will keep your clients coming back again and again to your social media. As a result you will be the first they contact when it’s time to buy, sell or refinance their homes. Mortgage & Real Estate posts are included in BlazingSocial plans for the mortgage, real estate and title insurance industries. Click an image to start slide show. Nothing impresses customers and referral partners like a news story relevant to their industry, especially when they’re written to position you as a trusted advisor. BlazingSocial creates three new infographics every week to keep your followers informed on the latest mortgage and real estate news. These infographics present the news in a very visual and easy to comprehend way. Mortgage and Real Estate News is included in BlazingSocial plans for the mortgage, real estate and title insurance industries. Position yourself as a trusted advisor and give your customers valuable, timely advice about home, life, and auto insurance. Insurance posts are included in BlazingSocial plans for the insurance industry. Social media video content has now gone from “nice-to-have” to “must-have”, which is why it’s important your business is sharing industry-relevant video content with your audience. BlazingSocial offers a substantial library of mortgage, real estate, and insurance videos, including a Spanish closed caption option. Schedule a time for the video posts to publish and we’ll take care of the rest. With BlazingSocial, sharing social video has never been easier. BlazingSocial contains videos branded with your contact information. When customers share your videos on social media, your brand goes with the shared video. You can add customized call to action links for lead generation, such as apply now, download my app, contact me, etc. The possibilities are endless. 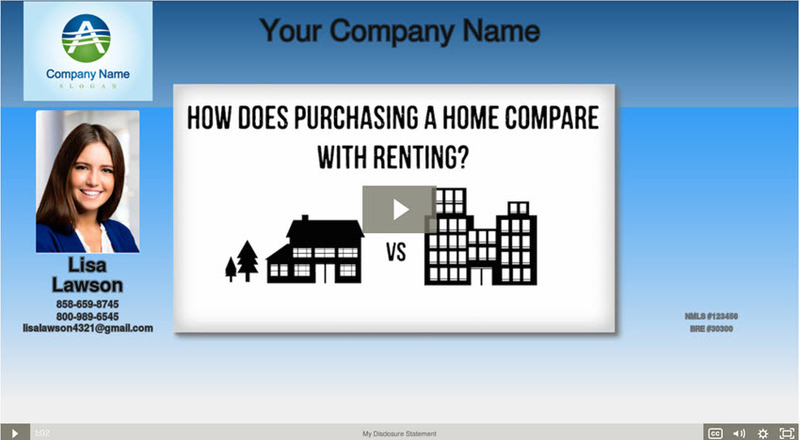 Closing Costs Explained Visually Closing Disclosures: Important Additions Credit History & The FHA Do I Need Homeowners Insurance? Fixing Credit History Errors How Can The FHA Help? How Interest Affects Mortgages How Large A Down Payment Do I Need? TRID Can Creditors Revise Loan Estimates? TRID Can Lenders Request More Information? TRID Do Lenders HAVE To Approve In 3 Days? TRID What Does The Loan Estimate Tell You? VA Loans And Divorce VA Loans: For Farms? VA Loans: For Rentals? VA Loans: More Than Once? What Are Builders Incentives? What Are Construction Perm Loans? What Are Discount Points? What Are Home Warranties? What Are Real Estate Commissions? What Are The Steps In FHA Loans? What Are VA Loans? What Does A Mortgage Cover? What If Interest Rates Fall? What Is A Mortgage? What Is A Rate Lock? What Is A Reverse Mortgage? What Is Ability To Repay? What Is Equity? What Is Loan-To-Value (LTV)? What Is Mortgage Insurance? What Is PMI? What Is Prime? What Is RESPA? What Is The FHA Loan Limit? What Makes Up Closing Costs? What Qualifies As Income For FHA? What’s An Appraisal? What’s A Credit Score? What’s A Qualified Mortgage? What’s Debt-To-Income? What’s The VA COE? When Do ARMs Make Sense? 6 Home-Selling Mistakes After Your Loan Application Am I Ready To Buy? Be There For Inspection? For Sale By Owner? Home Sales Tips: Prepping The Inside Home Sales Tips: Prepping The Outside How Do I Evaluate An Offer? How Do I Select a Broker? How Interest Affects Mortgages How Is A Home Marketed? How Large a Down Payment Do I Need? TRID What Is A Business Day TRID Calculating Your Cash To Close TRID Can Creditors Revise Loan Estimates? TRID Can Lenders Request More Information? TRID Can My Settlement Charges Change? TRID Could My Loan Exceed The Estimate? TRID Do Lenders HAVE To Approve In 3 Days? TRID What Does The Loan Estimate Tell You? TRID What Lenders Must Disclose TRID When Do I Get My Closing Disclosure? Walkthrough: What To Look For What About Flood Plains? What Are Builders Incentives? What Are Discount Points? What Are Home Warranties? What Are Real Estate Commissions? What Can I Ask Brokers? What Do Home Inspectors Do? What Do I Get At Closing? What Does A Mortgage Cover? What Happens On Closing Day? What If Interest Rates Fall? What If You Feel Excluded? What Is A Counter-Offer? What Is A Mortgage? What Is A Rate Lock? What Is Ability To Repay? What Is Earnest Money? What Is Equity? What Is Escrow? What Is Loan-To-Value (LTV)? What Is PMI? What Is The Punch List? What To Ask When Looking At Homes What’s An Appraisal? What’s A Decorating Allowance? What’s A Good Faith Estimate? What’s A Qualified Mortgage? What’s An Inspection Clause? What’s Debt-To-Income? First-Time Mortgages? Fixed-Rate Mortgage Advantages Fixing Credit History Errors For Sale By Owner? How Can The FHA Help? How Do I Evaluate An Offer? How Do I Select a Broker? How Does HUD Help? TRID Can Creditors Revise Loan Estimates? TRID Can Lenders Request More Information? TRID Can My Settlement Charges Change? TRID Could My Loan Exceed The Estimate? VA Loans: More Than Once? Walkthrough: What To Look For What Are Builders Incentives? What Are Construction Perm Loans? What Are Discount Points? What Are Home Warranties? What Are The Steps In FHA Loans? What Are VA Loans? What Happens On Closing Day? What Is A Counter-Offer? What Is A Mortgage? What Is A Rate Lock? What Is Ability To Repay? What Is Earnest Money? What Is Equity? What Is Escrow? What Is HUD? What Is Loan-To-Value (LTV)? What Is Mortgage Insurance? What Is PMI? What Is RESPA? What Is The FHA Loan Limit? What Makes Up Closing Costs? What Qualifies As Income For FHA? What To Ask When Looking At Homes What’s A Good Faith Estimate? What’s A Qualified Mortgage? What’s An Inspection Clause?